Our supplier has shut their doors, so it's with much sadness we are unable to take any further box orders. The search is on to find something similar elsewhere - we will keep you updated with any progress. A personalised Keepsake Box is the perfect place to lovingly store babies’ and children’s items that you wish to cherish for years to come. Sturdy wooden Keepsake Boxes are personalised with name and date or name and a choice of other phrases, then elegantly embellished in a colour-theme of your choice (alternatively you can leave this decision in our capable hands!). 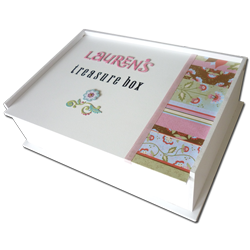 Very generously sized, these Memory Boxes allow you to store unfolded birth and baptism certificates, hospital mementos plus stacks of greeting cards. They will also fit a folded baby’s blanket and a few items of treasured baby clothing making them so charming for any New Baby, child's special occasion or as a beautiful memorial gift for an Angel Baby. Keepsake Boxes can be customised for any number of occasions (we have made several as beautiful wedding gifts), please contact us if you'd like to discuss something a little different, chances are we can do it! $15.00 FLAT RATE SHIPPING AUSTRALIA WIDE! Please allow up to 10 days for your personalised Keepsake Box to be despatched, plus shipping time (3-4 business days shipping time in most cases). Please take a look at our Keepsake Box Gallery for some ideas on how you'd like your personalised keepsake to be decorated - we can come up with something similar or design something completely different!